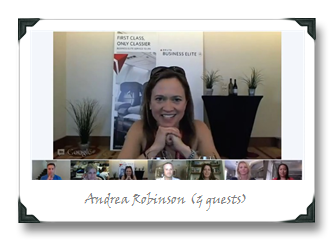 Last week, I had the pleasure of taking part in a Google+ video hangout chat hosted by Master Sommelier (and general dynamo/spitfire) Andrea Immer Robinson. Andrea asked me to participate in the hangout as part of select group to taste through wines that she had picked for the in-flight business class selection one of Delta Airlines’ cross-country routes (apparently I’m to get a free trip on that route as part of the deal to test the wines in flight myself, so this was a promotional chat sponsored by Delta). More on Andrea’s picks in a minute; first, I want to talk about something that Andrea brought up in the context of the hangout discussion (a video recap of which you can watch below after the jump). 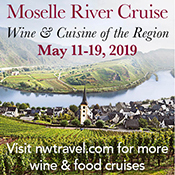 That event got my wine brain juices flowing, and not only because I was treading water, trying not to look like a complete hack in front of a group of mostly Master Somms, many of whom have individual taste buds on their tongues with more collective wine tasting experience than I possess. 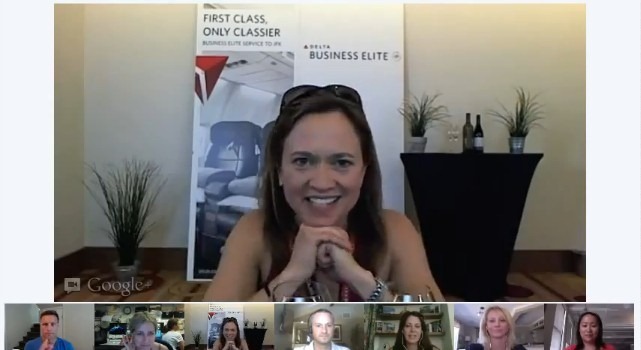 What intrigued me was something that Andrea mentioned about plane travel that impacted her choices of wines to include for the biz class long-haul journey: we (as in all of us, not just those banished to coach class) taste food differently in-flight versus when we’re on terra firma. According to the NYT article, this effect can even impact our sense of acidity, which means that it (the flights I mean, not the NYT article) might make some wines taste flabby (or at least less vibrant). So when it comes to food and – more importantly for us vinous geeks – by extension, wine, flying puts us at a disadvantage. Which means the normal (i.e., crappy) wine options you have available to you on most domestic U.S. airlines is at a double disadvantage, because it will taste even more bland than it would on the ground when served at your cousin’s wedding reception. To make matters even worse, apparently the plane’s engine noise itself can negatively impact our sense of taste. So we wine geeks are really screwed on those flights. Unless, of course, the airline is lucky enough to hire someone like Andrea, in which case you’ve got a secret weapon / tireless dynamo who will select wines that have a lot going on aromatically and texturally, and have good acid structure, so that they still taste pretty good at 30,000 feet. I’ll admit, the 14.1% abv scared me at first (c’mon, who reports the 0.1% ?!?? ), but there’s good balance to this weighty SB, with a strong citric, acidic backbone. There’s even a hint of minerality to carry the sizeable fruit, which starts out with grapefruit, lemongrass, papaya and herbs when chilled and then moves to tangerine and a more visceral texture as the wine warms up. There’s no shortage of flavor, that’s for sure, and enough verve to make the wine seem fairly well-balanced even with a few thousand feet of air between you and the ground below. Check out the vid for the Master Somm’s takes on food pairings (most of theirs were mouth-wateringly intricate; I went with a decidedly more pedestrian recommendation: take-out Chinese, specifically orange chicken). There’s a lot going on in this wine for the price tag, and I can see why Andrea was so keen on it. 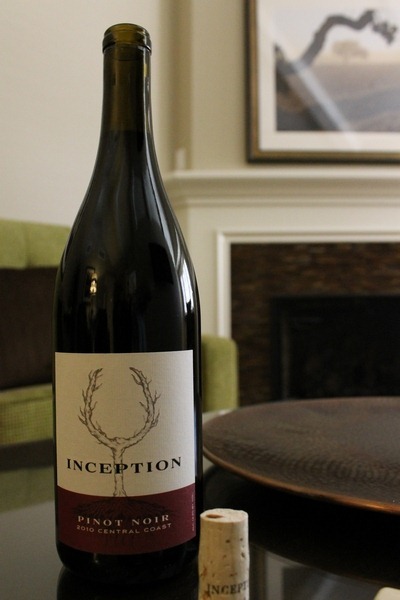 On the fruit side of things, there isn’t much complexity here, but there is a lot of plummy, vibrant red berry action. But when it comes to the secondary aromas, this wine has it going on; tea, earth, spices and a hint of maple (but just a hint!) from the oak treatment. The palate is fruity and lively, and I got the sense that it stood a god chance against the palate-deafening white noise of the jet engines. As you’ll see from the hangout vid, the fact that the Somms detected so many different things going on in this wine is probably a testament to its crowd-pleasing abilities. 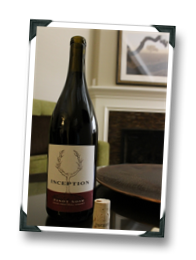 Thank you for the kind review of my baby–the Inception Pinot…we are totally stoked that Andrea and Delta gave us the thumbs up for not one…but two of our wines for this new program!. I'd love for you to critique our entire lineup. Thanks, Jonathan – happy to accept the lineup for possible review (e-mail me and we can discuss). Congrats on the Delta nod, I look forward to also trying them sometime in the air :).